Tucked away at the back of the Harwood Museum of Art in Taos, New Mexico, is an eight-sided gem of a room under an oculus, one side being the doorway, allowing visitors to enter and participate in the stillness and beauty of the space. The other seven walls (each eleven feet square) are all displaying one five-feet-square painting. This is the Agnes Martin Gallery, a special addition to the museum in 1997. Formally, the room shaped like a kiva (a chamber for Pueblo Indian ceremonial rites) is called a ‘gallery’ for the art it contains. It, however, also feels very much like a chapel for the quiet and awe it inspires. Its octagonal shape is significant for Jews and Christians alike in the perfection symbolized by the number seven, in Genesis the seven days of creation and the eighth beyond them, going beyond the natural rhythm of time into what is transcendent and eternal. For Christians this is the new day, the beginning of the re-creation, initiated by Christ’s life, death, resurrection and ascension. So much has been written about Agnes Martin’s work, I thought I would focus on how this room 'works' as a chapel. I have been there before and been delighted, but I wanted to experience the gallery afresh, trying to see it with new eyes. As I first peer in the doorway, I wonder how it is that this plain room, extremely white-feeling overall – except for some of the very light blue of the paintings, the warm, golden browns of the wooden flooring and in the center of the space four minimalist wooden stools that at first seem to be too garishly gold for the pristine atmosphere – ever intrigued me, allowing me to feel a sense of the holy. Entering and making my way to one of the stools to camp out for a while, I lose confidence a bit in the thought of attempting description. So I try just to take stock of where I am. Indirectly lit by oculus and simple electric light fixtures fixed on the ceiling above each one, the seven paintings are merely broad creamy-white and blue-gray stripes in muted tones and different combinations, one in particular barely even distinguishable from the white wall behind it. These are what some describe as minimalist paintings. In this later period Agnes Martin was known for works that look almost like graph paper. At first sight they look like a series of horizontally long rectangles of very pastel colors. One’s first thought may even be ‘Venetian blinds’ in some beach-y resort setting or the faded stripes of prison uniforms! I’m rather embarrassed by that thought – it doesn’t seem ‘high’ enough for this unique room. Then I begin to consider the paintings as windows, windows yet to be opened but somehow inviting one toward mystery. It seems that rather than the label ‘minimalist’ Agnes Martin herself preferred the term ‘abstract expressionism’ to describe these works, and as I continue to sit, continue to let my busy mind become calm and just to be, I begin to feel that distinction and agree with her. These paintings arouse life, movement, feeling, and a yearning. 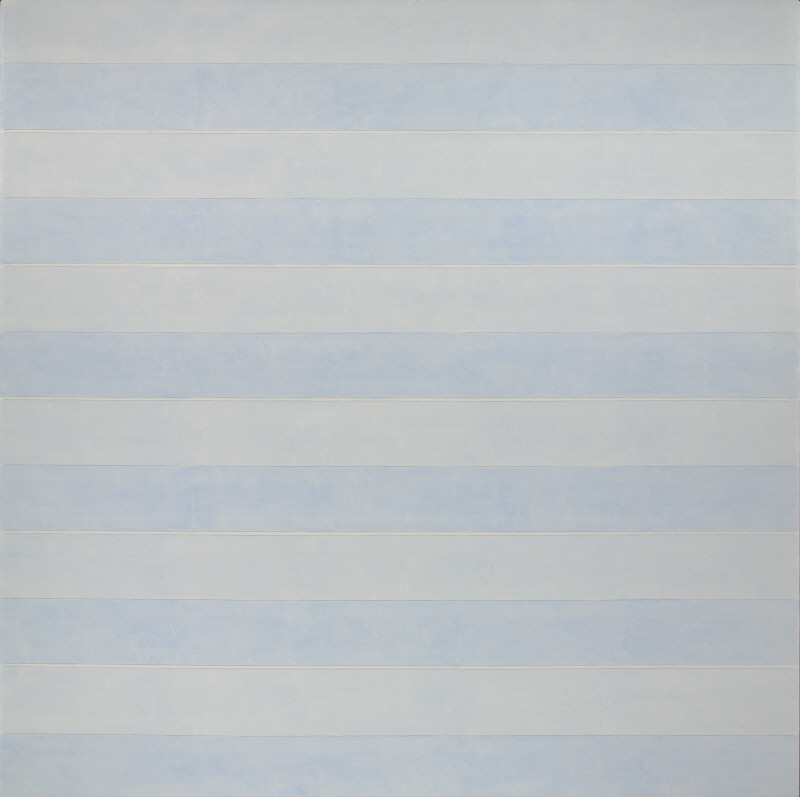 My first seeming favorite, Friendship, is the third painting in clockwise: a blue, wide-striped painting with perhaps centimeter-wide stripes of white below each of the wider blue swathes, although there is a sense of even more mottled blue underneath it all, even behind the white. As I sit longer and feel more peace, I start to see other colors along the edges of the blue and white. I thought I had remembered that surprising effect from my previous visit several years before: pinkish tones and peach, adding more warmth and a sense of radiance. And to my surprise I begin to be drawn in the end to the one I thought I liked least. The kind of one about which someone always has to say: ‘I could paint that at home – what makes it so special?! I don’t understand this modern art!’ It’s called Innocence, the sixth one in on the right-hand side when standing in the doorway. It is the all-white one, barely distinguishable from its wall except for the chrome frame. But as I gaze at it, a depth begins to surface. It appears to be all horizontal white stripes, but I begin to catch glimpses of ghostly vertical, slightly blurred white lines. The beauty shimmers. I happen to look down at my mobile and to my surprise see that my parents are calling from a couple states away. They are in their late eighties and have begun to lose a lot of short-term memory. I don’t want to pick up in this space, this silence, yet I worry about them – so I do, very quietly. My father wants to know if he has paid our 2017 American Auto Association membership fee, something we’ve gone over before. And I have to laugh (again, quietly): even this earthly concern for AAA fees is absorbed by the deeper joy in this place. I’m glad to hear my father’s voice and wish he were here with me in the peace. Finally I decide to test the space even further and more specifically as a chapel. I pull up the Magnificat meditation for the day on my iPhone. It’s by Servant of God Monsignor Luigi Giussani, a priest in Milan who died in 2005, and it is entitled ‘What are you looking for?’ [Another quiet laugh!] I read, ‘…Christ, Light and Strength for every one of his followers, is the adequate reflection of that word with which the Mystery appears in its ultimate relationship with the creature, as mercy: Dives in Misericordia (Rich in Mercy). The mystery of mercy shatters any image of complacency or despair… The Mystery as mercy remains the last word even on all the awful possibilities of history.’ Silence. Then awe. Here it is, something to help me grasp even further, at least in part, what this space is about. These paintings around me, the very space itself, feel infused with a blessed sense of mercy about to burst through the 'windows'. And Ms. Martin, not an orthodox Christian by any stretch of the term as far as I know, I have a feeling, would agree or at least be intrigued with this ‘coincidence’ of her paintings in this chapel and a reading on mercy in this still-mysterious room. Agnes Martin: Untitled (Friendship), 1993-1994, painting acrylic on linen, 152.5 x 152.5 cm. 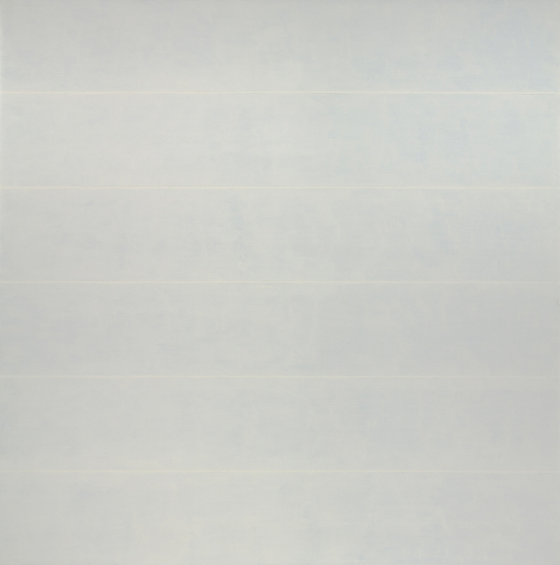 Agnes Martin: Untitled (Innocence), 1993-1994, painting acrylic on linen, 152.5 x 152.5 cm. Photos © 2017 Agnes Martin / Artists Rights Society (ARS), New York. Agnes Martin (1912-2004) was born in Saskatchewan, Canada, but eventually lived and painted in Taos, NM, from 1952-1957 and from 1973 onward. Once the Agnes Martin Gallery was added on to the Harwood Museum, Taos, NM, Martin herself took great joy in sitting often in this gallery of her own seven paintings. The original Harwood Museum complex was comprised of a number of small adobe buildings that artists Burt and Elizabeth Harwood developed into their own beautiful home and public library for Taos beginning in 1916. The Harwoods were part of the significant movement of artists to northern New Mexico in the early part of the 20th century in pursuit of a true form of American art. They were influenced by the beauty of this high desert and mountainous region with its spectacular lighting and by the area’s defining Native American and Hispanic cultures. Libbie Weber is an Anglican priest at The Fellowship of St. Barnabas, Albuquerque, New Mexico, USA, and often likes to use works of art as the basis for sermons and retreats. She is working toward her Certificate in Formative Spirituality at the Epiphany Academy, Pittsburgh, PA, USA, founded by the Dutch Catholic priest and theologian Adrian van Kaam and his longtime colleague Dr. Susan Muto. For more information on the gallery, see http://www.harwoodmuseum.org/exhibitions/view/59 -- and enjoy the Ollie Bell time lapse film linked to that page, especially taking note of the oculus lighting changes during a 24-hour period. For a very interesting, more in-depth article on Agnes Martin's work from a Christian faith perspective, see Joanna Weber's (no relation!) article 'The House that Agnes Martin Built' in Image, Issue 63: https://www.imagejournal.org/article/house-agnes-martin-built/#login.